Hidden Histories, Public Libraries addresses collective digital reading experiences in the public space. 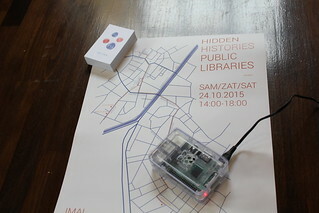 With a set of DIY and Open Source tools to publish and access documents in situated locations, the project invites the visitor to participate in its interrogations: in the streets, can connected mobile devices extend the tradition of collective reading experiences? How can people share materials and generate new urban imaginaries? How to enable hidden histories to re-emerge? Discover sounds, images and other documents from the Brussels' past and the present through your mobile phone and the Hybrid Player application. Get all the information to build it yourself and use it in other contexts! With Loraine Furter, Daniel Jackson and Simon Worthington. In collaboration with BNA-BBOT and La Fonderie.